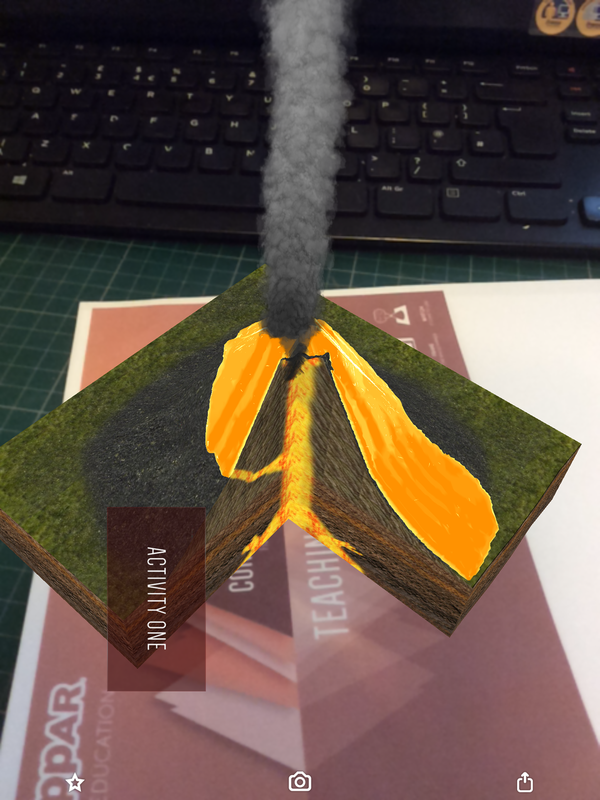 Thanks to a tweet from @ThatEdTechGuy from https://thatedtechguy.wordpress.com/ I was introduced to blippar for education (@blippar) this morning. As well as operating in business, the education section of this company seeks to transform education settings such as schools into digitally interactive learning environments using Augmented Reality. I am still new to exploring augmented reality in the classroom but I know it has great potential for generating student interest and engagement which can only be a great thing! The idea is that it can be used to bring textbooks and other learning materials to life using smartphones or tablets. 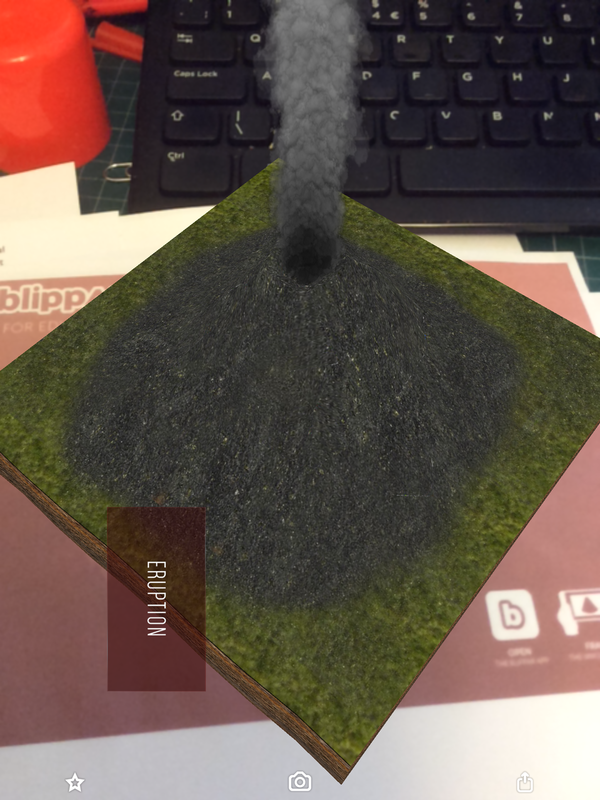 For me one of the most exciting things about this mornings discovery of blippar was not just the volcano that came to life on my actual (not virtual) desktop (see photos!) but the fact that blippar are taking augmented reality one step further to ensure it is not just a novelty but an integral part of the learning process. They have done this by introducing a series of education posts (described here in their blog post). These make the AR integral to the classroom experience by enabling the teacher to lead the lesson by using the blipp (AR component) in explaining to the students what happens. 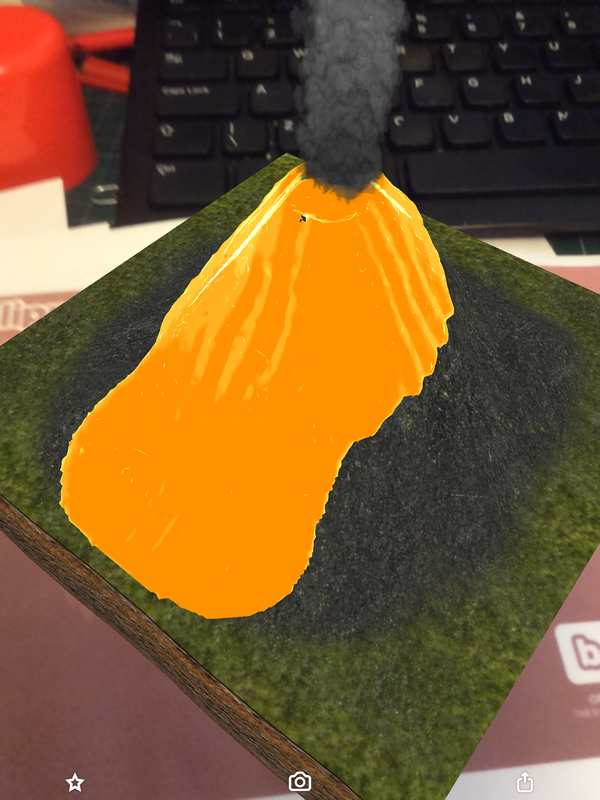 The volcano blipp (See photos below) involves students connecting to the teachers device by a special code – the teacher then gradually initiates the different parts of the blip, from the eruption through to opening the volcano up as a cross section. Taking this a step further, students then have a labelling activity which they undertake and the results go to the teachers device as a way of monitoring progress. 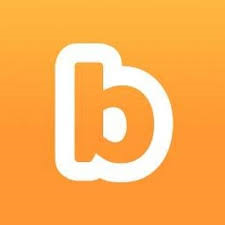 Unfortunately we are not a 1:1 tablet school at the moment but I am really interested to try this with students that do have their own devices and I’m particularly keen to see where blippar take this next. For me this is the first step to really making the most of AR and one which I can see being of great use in the classroom. To have these embedded in textbooks and revision guides would also take experiential learning to the next level. I’ve recently come across Edynco which I’m hoping to try out over the next couple of weeks. I think this could have really good potential for helping students with revision and linking concepts and key ideas to support recall. 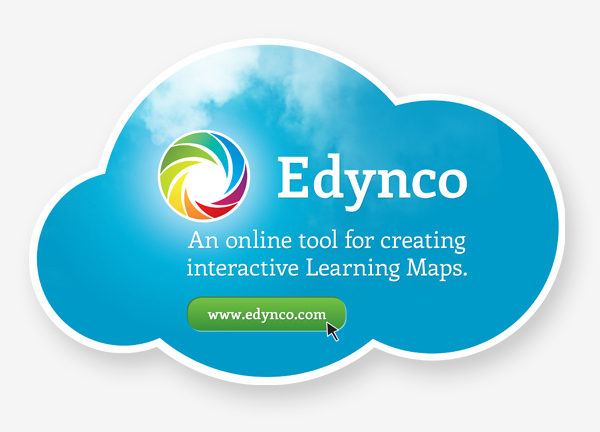 Edynco enables simple mind-maps to be turned into interactive learning maps with the addition of other resources and links such as attached documents, audio, video etc. A quick and easy to use free tool for converting .pdf documents to word is available from investintech.com. This useful, free tool is online based and enables you to convert scanned .pdf documents to editable word documents. Simply browse for the .pdf file you wish to convert, insert your email address and click convert. Once the conversion has been completed a download link will be sent to your email address. When I tried it it worked perfectly but there was a 30 minute period before the conversion download link was emailed. Whilst the free version has the inevitable wait time, there is also a paid version available which allows direct conversion from your desktop Able2Extract PDF Converter 9 allowing conversion to 10 different editable file formats (including Excel, PowerPoint etc.). Emaze – an alternative to PowerPoint? Emaze looks like a potentially useful tool which can be put to good use in education, whether it is for students to create online presentations for homework or assessment purposes, or for teachers that want to create a presentation with a different look to PowerPoint with stunning visual effects for added impact, either in the classroom, or for creating CPD presentations for training purposes. Emaze is also said to have animation facilities which surpass those available on Powerpoint. It is a cloud based technology so you can access your presentations from anywhere. Another benefit is that it is multi-device so that it can be viewed and edited on PCs/ tablets / smartphones etc. There are also ready made templates and slides which can be easily edited. Whilst Emaze wont replace my use of PowerPoint and SMART notebook in my teaching I can certainly see the benefit of having another tool in the toolkit when wanting to make a particular impact with a presentation, for example I am quite keen to try it out for creating an options presentation for KS3 into KS4 with a different look to the standard PowerPoint overload. With more and more students making use of digital media to present homework tasks I can also see some of them putting the free Emaze account to good use. There is also a presentation template designed specifically for education. Whilst there is free account option there are premium plans for those that want to do more, including a special education plan at a reduced rate which includes all the features of their premium plan. With the pro version there are additional options, including creating video presentations which can be shared on blogs etc. Thanks to Danny Nicholson, for the link to a brand new website called “Teaching Videos” set up by Mark Warner. The webiste is designed to bring together educational videos that have been recommended by other teachers. There is going to be a function soon where you can actually register and recommend videos to be added. Over time this should begin to develop into a really useful archive, and will save some searching on You Tube etc.. particularly in the knowledge that videos highlighted on this site have been recommended by teachers as good for use in the classroom. There are a number of videos that have already been added, but it is worth bookmarking the site and checking back when you are looking for videos as the site is destined to keep growing. The videos are categorised according to subject / topic area as well as according to key stage making finding videos simple! As well as curriculum subjects, there are also videos classified as useful for professional development and assemblies. Last weeks Teaching and Learning group meeting was focused on looking at the use of audio-visual resources in the classroom. Audio-visual resources can greatly enrich the everyday classroom bringing to life teaching and learning opportunities and giving the potential to bring the outside world into the classroom broadening and enhancing our students experience. There are many ways in which audio-visual resources can be utilised and this is an area we will keep returning to. The aim of our last session however was to look specifically at the use of combining audio, video and images to create short educational presentations in video format which can be played using programmes such as Windows Media Player or Real Player, or converted to a .flv file (using zamzar) and inserted into a Smart notebook file and then annotated etc. 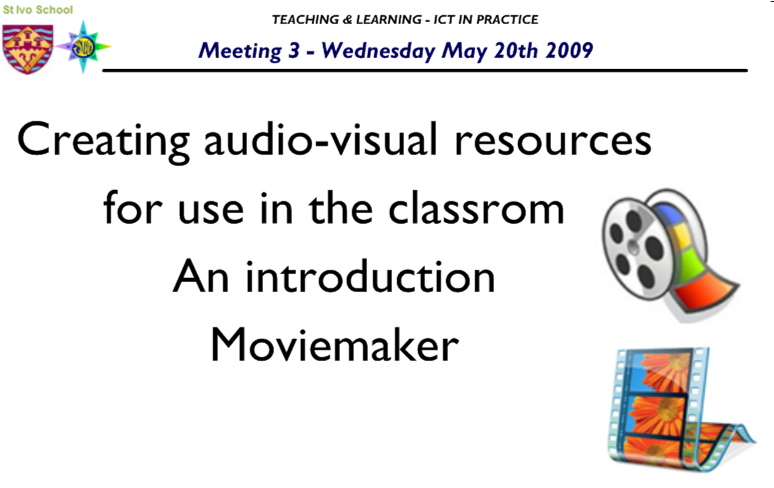 At the meeting I showed example presentations for each of the above – if you were not able to be there and would like to see them to get an idea of how moviemaker can be put to use give me a shout! There are many programmes which can be used to create video presentations and they vary in their degree of sophistication and thus what is achievable. A great starting point, is Windows Moviemaker, which is a free application which is available on all computers which run Windows. 1. Instructions for creating a simple movie – I have created a simple set of instructions which can be downloaded here on how to create a simple movie using Windows Moviemaker – including the addition of images, video, text, audio etc. The important thing to remember is that there are TWO stages that you must go through when you actually save your movie. (i) Save Project as (this saves the actual file so that you can come back and edit it) (ii) Save Movie File (you must do this so that you can play back your movie in the classroom! – remember it is the .wmv file you will need to save and take in!). Please read the full explanation of this in the instructions leaflet. 2. Getting used to the interface – the Windows movie maker interface is very user friendly – this downloadable outline may help you identify the main parts of the interface that you will be using frequently. Windows Movie Makers forum – lots of great ideas as well as a forum where you can seek help! Please make sure that you bear in mind copyright issues when making audio-visual resources – particularly if you are sharing resources with students on line. There are many photographs, music etc. which are shared under creative commons licenses which enables them to be used in creation of resources as long as the owner of the copyright is credited (e.g. in a credit list at the end). Some video clips – such as those in YouTube can be downloaded using zamzar (www.zamzar.com) into a format which can then be used in video editing software.